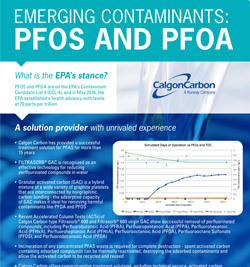 Calgon Carbon has offered the proven treatment solution for PFAS removal in both drinking water and remediation applications for over 15 years with our FILTRASORB granular activated carbon (GAC) and Equipment product lines. Calgon Carbon provides a complete solution including activated carbon, equipment, on-site installation and exchange services, reactivation, and financing. CCC offers a full range of GAC adsorption equipment—a simple and effective solution that requires little operator involvement. Testing is important for system design and cost performance information. Communities already using GAC for to remove T&O or other contaminants from drinking water sources have been protected from PFAS. We have a focused PFAS Team in place and are ready to respond immediately with technical services, equipment and carbon supply. CCC FILTRASORB can remove typical levels of PFOA and PFOS to non-detect levels. Our studies show that reagglomerated, coal-based GAC performs significantly better than coconut for PFOA and PFOS removal. Even if local regulations require lower PFC concentrations than the EPA health advisory, GAC is an effective solution. Coal based GAC effectively removes short chains. Our reagglomerated bituminous coal-based product will remove an array of PFAS including both long- and short-chain compounds. Reagglomerated coal-based GAC effectively removes GenX to non-detect levels.